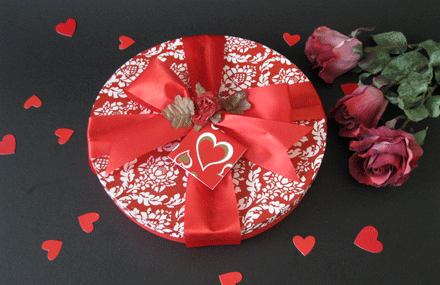 Round gift box with red and white damask print cover and red bottom, tied with a red satin ribbon with antique pink rose and heart gift tag. Contains an assortment of Russian, Black Russian, Pistachio, Black Almond and White Almond cookies. Box Size 9-1/2” dia. X 1-3/8” ht. Box Size 8” dia. X 1-3/8” ht. **Flowers in the background are not included.